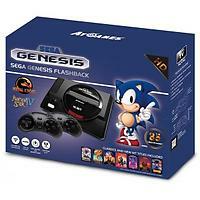 The all-new sega genesis Flashback has a stunning new design, reminiscent of the original console, and features 85 built-in games as well as an integrated cartridge port that plays almost all of your favorite Sega Genesis and Mega Drive original cartridges. Built-in all-time favorites include the Sonic series, Mortal Kombat series, Phantasy Star series, and Shining Force series games. Two new high performance 2.4ghz wireless controllers, styled after the Sega Genesis originals, are included, as well as two legacy controller ports for optionally wired gamepads.